Robbie Robertson (c) and the man who gave The band its name, Bob Dylan. While Dylan was happy to perform for his old back-up band’s farewell, promoter Bill Graham says he almost succeeded in being the only friend who wasn’t filmed. Robbie Robertson, lead guitarist and semi-official spokesman for The band, spent six months running in and out of The Shangri-La sound studio in Malibu this winter, carefully, slowly, methodically working to perfect the mix of the soundtrack for The Band's feature film, The Last Waltz. Those six months were five months over the normal amount of time required, even for a 24-track live recording that was being overdubbed and remixed. The lanky, 34-year-old Robertson admits as much, but counters, "That's the way it is in mixing movie soundtracks - it's very behind on that end." The soundtrack aimed at stereo sound more than complete crispness, he explains: "It wasn't mixed so that is has a shimmering, slick hi-fi sound. It's just that the complicated effects are difficult to balance - just a they were in the film." 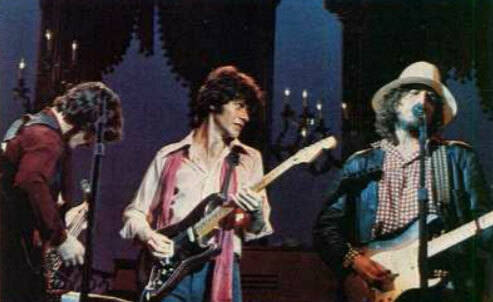 The Last Waltz is a concert film, a record of the final live performance by the five members of The Band. The concert took place at San Francisco's Winterland on Thanksgiving Day, 1976, and was attended by 5,000 lucky fans and more than a dozen of the most esteemed names in rock history - including Eric Clapton, Bob Dylan, Emmylou harris, Joni Mitchell, Neil young, Ringo Starr, Van Morrison, Muddy Waters, Dr. John and Ronnie Wood. A going-away present of sorts from The Band to their fans, the concert was intended as a celebration. The soundtrack which came out of it (Warners) is a deluxe 3-record set featuring The band by itself on 13 cuts, and accompanying their famous friends on another 15. The Canadian-born Robertson was the mastermind behind the entire project. Together with his four fellow Band members - drummer Levon Helm, bassist Rick Danko, keyboardists Richard Manuel and Garth Hudson - Robertson decided the concert was to be filmed and recorded for posterity, and Robbie engaged Hollywood director Martin (Taxi Driver) Scorcese to manage the filming. Bill Graham, the well-known promoter who backed the concert, recalls a crisis that came close to wrecking Robertson's plans for the film. "Robbie came to me a minute before Dylan was supposed to go on, shouting 'He won't let us film him. What'll I do?' Dylan had posted a guy by each camera onstage, and would not go on if it was rolling. I told Robbie, 'Go ahead, Don't worry.' He was still in doubt, I know, but when Dylan came on, you know me, I had my stage crew pull those guys off the cameras, and you have the result." The result is a stylish movie, which director Scorcese filmed with the aid of eight of Hollywood's best cameramen. The musical results can best be judged on the Last Waltz soundtrack, which is an impressive combination of the band's greatest hits (13 numbers, all written by Robertson, save "life Is a Carnival." Which was co-written with Danko and Helm) and a sampling of their superstar friends' famous numbers. Included on the soundtrack - but not in the movie - are a rousing version of "Tura, Lura Lural (That's an Irish Lullaby)" by Van Morrison; "Down South in New Orleans," a bluesy number featuring Dr. John and Bobby Charles; "I Don't Believe You," a little-known Bob Dylan tune; and "The Last Waltz Refrain," sung by Bandman Richard Manuel and written expressly for the film by Robertson. Among the soundtrack's high points are Band reworkings of their most popular tunes, "The Night They Drove Old Dixie Down," "Up On Cripple Creek," and a holiness-tinged collaboration with the black gospel/rock group The Staples on "The Weight." With Robertson and crew backing, we hear Van Morrison in a wailing version of "Caravan," muddy Waters powering a driving "Mannish Boy," and Bob Dylan contributing four numbers: "Baby Let Me Follow you Down," "Forever Young," "I Don't Believe You," and a finale with the entire superstar cast, "I Shall Be Released." "Robbie Robertson is a careful, painstaking man," says Paul Wasserman, Robertson's press agent. "He spent literally hundreds of hours in the studios, working for what he considered the perfect sound." The methodical Robertson was born in Toronto in 1944. His family was unremarkable musically, but the young Robbie was already playing a mean guitar and writing his own songs at age 13. By 15, he was a member of the Canadian Musicians Union, and had done gigs with local groups including The Robots, The Consuls, and Thumper and the Trombones. The young guitarist's compositions drew the notice of Ronnie Hawkins, an expatriate American working in Toronto who was best known for his rockabilly sound. Hawkins recorded two of Robbie's songs in 1959, then invited him to join his back-up band, The Hawks, a year later. After three years of touring with Hawkins, the back-up group split off, becoming Levon and the Hawks. In early 1966, Robertson was hired as an accompanist, along with Levon Helm, by Bob Dylan. By the year's end, Dylan took in the entire group to accompany him on his world tour. In the summer of 1968, after a year living near the recuperating (following his motorcycle accident - Dylan, the group released its first album on Capitol Records, Music form Big Pink. They had renamed themselves The Band, which was the way industry people had been referring to them anyway, as in "Bob Dylan and The Band." Their name finally was established by Big Pink's popularity. Through the 1970's, they released albums at a rate of almost one a year - The Band (1969), Stage Fright (1970), Cahoots (1971), Rock of Ages (1972), Moondog Matinee (1973). There followed a slowdown, interrupted by a tour with Dylan in 1974 and the release of Northern Lights - Southern Cross in late 1975. In 1976, they made the decision to stop touring, and the concert at Winterland - where The Band made its first headliner performance in 1969 - was set. Then came the nearly two-year wait for the movie and soundtrack. "We wanted to get inside the music," Robertson says of the film. "Every other pop music film I've seen was a letdown. We didn't want this to be the Johnny Carson show with music. We wanted to show what 16 years on the road meant to The Band so that anyone could understand it - not just the people wearing 'hip' buttons. "Unintentionally, the film has elevated to star status the media-shy, self-conscious Robertson. While all members of The Band come across as genuine and unaffected, Robertson's star quality - based on his good looks and intuitive understanding of the camera - is striking. Will this mean te near-recluse will go Hollywood? Says one observer close to the group: "Robbie Robertson is a musician, a serious and dedicated one. The Last Waltz will just let the rest of the country in on his talents. But I don't think he's going to change his ways." Interview material for this story provided by G. Archer Kitman. This article has been viewed 2,285 times since being added on February 6, 2017.